Patrick Kane and Corey Crawford had big contributions this playoff run. 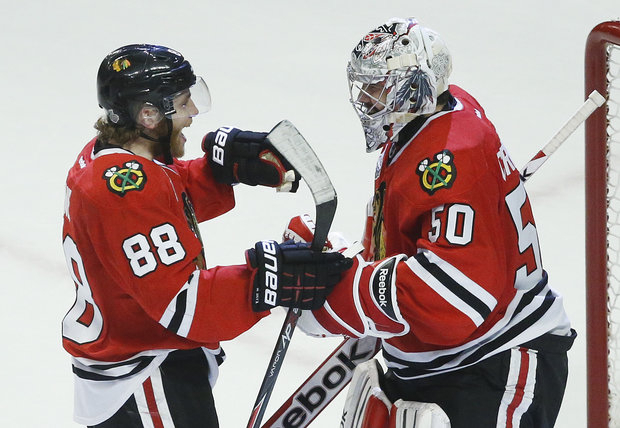 Ptrick Kane and Corey Crawford have paved the way for Blackhawks championship. It is amusing how people that normally could care less about hockey are now into it. Something about winning and the excitement attached to it is very infectious. At a family wedding last Friday, I had become a listener to everyone’s opinions about the Blackhawks, even though I have been covering the Blackhawks the whole regular and post season. People want to tell me what is happening, or quote the “experts,” prior to the past month, many of these folks didn’t care to speak about icing, or glove side or controlling the puck. Now they do – and that’s OK.
Just think: this NHL season was in a dire spot. It was dangerously close to being canceled and it was saved. A 48-game schedule was put in place and it had an interesting twist, since teams only played against their conference opponents. It would make this Stanley Cup Finals much more intriguing than anyone could imagine. NHL Commissioner Gary Bettman can thank his lucky stars that the Blackhawks created a huge interest with the start the they had for this shortened season. With 24 straight games, they earned a point. It even caught the attention of a NBA superstar LeBron James. He was in the middle of an incredible winning streak; he commented and Tweeted about the Hawks. The night the Bulls stopped that streak, Blackhawk star Patrick Kane was at the United Center for the basketball game. We had a nice chat about the mutual respect he and James have towards each other. Now, Kane and his teammates are on the verge of doing what LeBron and the Miami Heat did last week: win a championship. The Hawks are up three games to two over the Boston Bruins and tonight they can win Lord Stanley’s Cup on the road at TD Garden. Winning game five was in large part because Patrick Kane shined like the star that he is scoring two goals. Kane now has an opportunity to repeat what he and the Blackhawks accomplished three years ago, winning the Cup in enemy territory. Who could forget when the 21 year old Kane scored the winning goal in Game 6 overtime against the Philadelphia Flyers in overtime? When it happened, hardly anybody knew it had gotten past Flyer goalie Mike Leighton. It ended a 49-year-old drought and now Kane wonders if his team has a chance to re-create the same situation in Boston. “I don&apos;t know, I think the stars would have to be aligned right for it to happen like that again,” he said. If the Blackhawks are able to beat the Bruins tonight, there will be a matter of which player would be named the Conn Smythe winner (the Finals MVP). There would be several candidates, Kane, Patrick Sharp and Corey Crawford. Yes, Crawford has a tough Game 4, but he rebounded very well on Saturday. It is so close that it may come down to the biggest star, in possibly the biggest game of these Finals tonight. And if the Hawks are unable to close the deal, they have a chance to do it at the United Center on Wednesday. You have the feeling this city is about ready to burst with excitement, even if most became fans just a few weeks ago.